Squish, squelch, splash, slime, drop, smear, toss, spray, and ooze. I love watching my daughter make a mess because I know the benefits of messy play far outweigh the necessary clean-up. 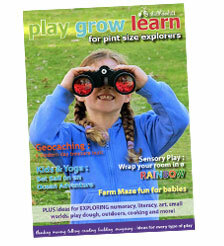 Children are active learners and learn through play. 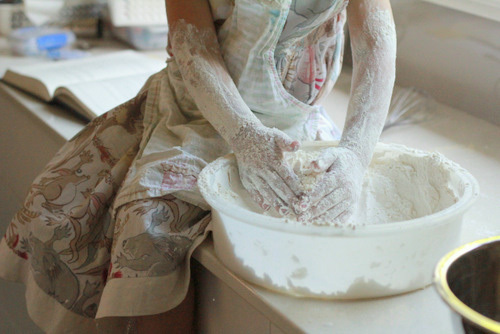 Messy play is particularly valuable because it stimulates many of their senses at once. They can feel, smell, see, and sometimes even taste the consequences of their messy active play. 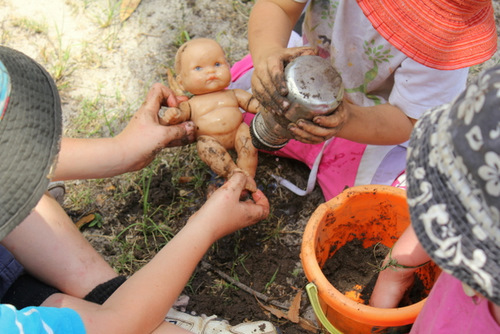 Children are doing many things at once when engaged in messy play. 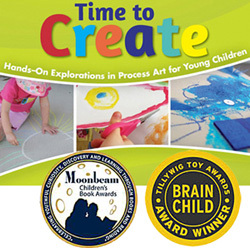 They can be observing, creating, building, exploring, imagining, discovering, investigating, interpreting, even relaxing. They are the ones directing the learning opportunity. There was a moment a while back when I realised that not all parents appreciated the value of messy play as much as me. I was walking home from the train station with my daughter. It had been raining and there were puddles everywhere. I was delighting in watching my daughter jump from one puddle to the next. Another child about the same age was watching and decided to join in. She jumped into a puddle with a huge smile on her face. ‘Splash!’ Seconds later her Dad slapped her and cursed at her for getting wet. I was horrified that we had tempted the child to get into trouble, but I was even sadder that she’d lost an opportunity to experience the delight of jumping in puddles. Pack spare clothes when out and about, or at the very least have a set in the car, so that wet and muddy clothes can easily be replaced with clean ones. Restrict messy play to occasions when you have the time to clean up the mess. Protect clothes with a paint smock or apron. Use water-based paints because they are easier to wash off skin, clothes and furniture. Cover surfaces with a washable drip sheets or old towels. I have a large washable plastic sheet that I put down before my daughter starts painting or playing with play dough. 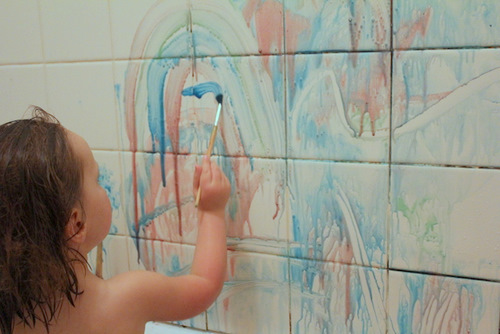 Restrict the messy play to an area that’s easy to clean, like the bathtub, shower or outdoors. 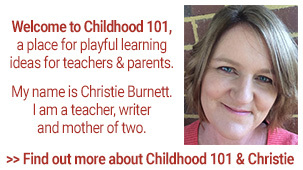 Set clear rules about what children can and cannot do with the medium they are playing with. For example, ‘the mud stays outside’, or ‘the playdough stays on the table’. Supervise. Children making mess can get lost in the moment and forget the rules. They’ll likely need you to be nearby reminding them of their boundaries. Relax and smile. 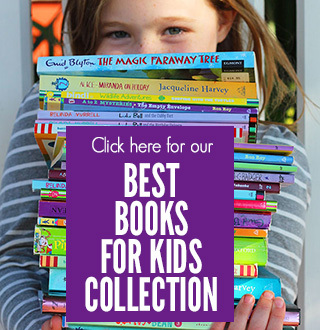 You might not like getting covered in mud or sand, or having to travel home in wet clothes – but kids love it. 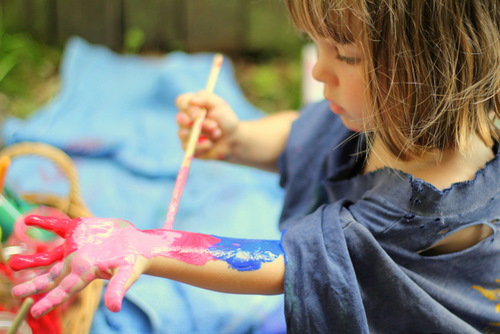 Do you embrace messy play or is it something you try to avoid? How Clean is Your Mess-O-Meter? Grew up being allowed to explore and be messy! As I got older I was scared of mess, it was such a chore. I have 2 boys. 26 months and 10 months. I catch myself getting upset at those moments where is dumps tomatos or paints his toes. But then I remember its how he will learn and love and have fun. The less rules of play I enforce the more he grows abd blossoms abd every day I see a new emerging skill they learn!!! Thanks for the reminder to be prepared to set them up for success is their best base of Learning. What a fantastic post! I love messy play with my twins and am not fussed about what their clothes look like at the end of the day ...i prefer them to be messy because then i know they have had a good day! You are right that not all parents embrace messy though as i have had a few comments on my blog re the mess and the state of the girls clothes and often had parents get upset when picking their own children up from child care because they were covered in paint or sand etc. Loved your observations and pics...thanks so much for sharing! 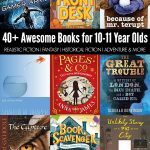 I love this post, and some excellent ideas, and all the photos are great too! I too see so many little kids get in trouble for daring to do something (within reason) slighty messy, it saddens me. great post, great photos. I agree with what I think you are saying in that messy play isn't a total free-for-all, kids gone wild thing. It can be freedom within parameters, and even within those parameters set by the adult (for purposes of safety, time, convenience, realistic expectations), there is infinite possibility to explore. 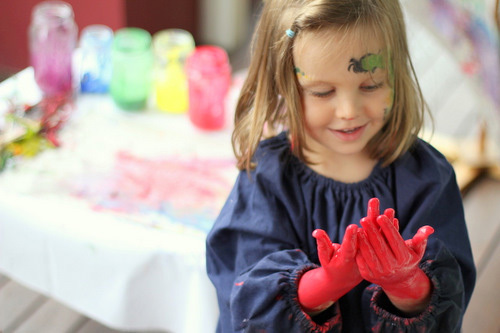 I adore messy play - if I pick my child up from childcare and her clothes have paint or dirt on them I always thank her carers as I know it means she's had a fun day! My tip when engaging in messy play at home is to have a clean up station ready to go before you even start (a tub of hot soapy water, an old towel). It means hands covered in wet paint don't make it to the walls/furniture (and don't even have to go inside) while I'm organising a tub of soapy water. I love messy play! 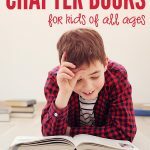 Children need to get their hands IN and ON and ALL OVER :) Great post! 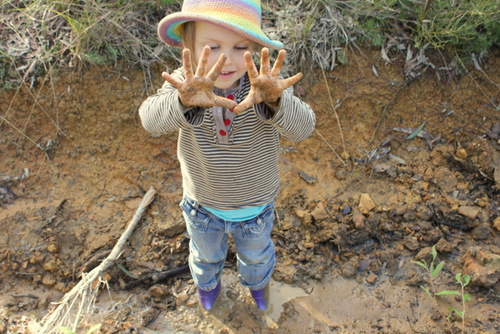 I agree, children should be given more of an opportunity for messy play inside and outside of school. It's lots of fun for them and they can learn at teh same time too. educatioun should be fun, that way students will be more motivated and more learning takes place. They'll happy a happy, fun learning experience. Well I'm one of "those" parents. I don't like mess. Even more so I don't like mess when we are out - as often we are going somewhere else after a playtime. But mostly I just don't like cleaning. That's it. BUT I do understand the benefits and need of my kids to engage in messy play. So I restrict it to when I'm in a comfortable position to clean up, which is usually when it's planned, or we are home. If he was out and got messy with someone else to do the clean up - then great!! 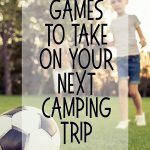 Please don't judge us parents who restrict our kids in public - you don't know what we are about to do, or what we've already been doing, and sometimes "no" to mess is necessary. Gorgeous post Tricia. I don't do as much messy play at home as I'd like, because with a 1-yr-old who is a little wild, it can get out of hand. But I would dearly like to find a way for my 4-yr-old to get messier at home. 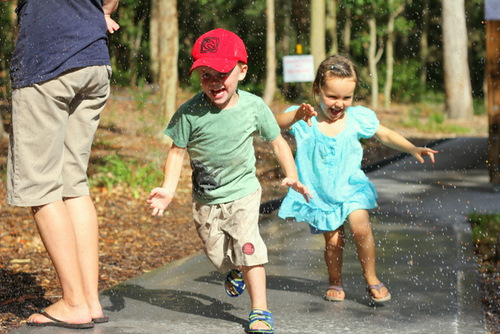 Though I do make a point of smiling and laughing with him when he goes through puddles. I don't really care if he gets wet or muddy (unless he's wearing good shoes). That's the beauty of living in Australia - everything soon dries! Love this. In my 16 years in day care the best experiences have been when I threw caution to the wind, and just let them go. The messy activities are always the best ones. Children learn so much through freedom of expression. They can also teach us so much. Embrace the mess!!!!! We love messy play - I have a 2 year old and an 11 month old and it's all the craze here. As it's winter messy play here takes place in our kitchen - we have tiled floors, a sink and plenty of soap once the weather warms up it will be split between the kitchen and the garden. I wish I had more space as we have a small house but it works well at the moment.